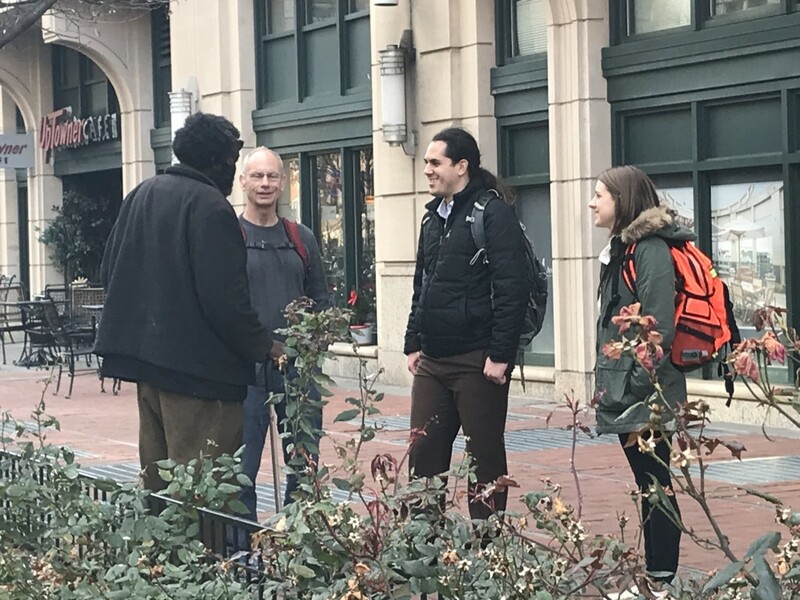 On a chilly afternoon this past December, I accompanied GMC Executive Director, Gunther Stern, and GMC Consultant Psychiatrist, Dr. John Tarim on street outreach (a program where GMC staff check on and visit with individuals experiencing homelessness outside of the Center, directly on the streets). We’d been walking for about an hour and as we made our way down a street in West End, Gunther called out a greeting to an approaching figure — a large man, well over 6 feet tall and of a stocky build, walking with a cane. To protect his privacy, we’ll call him Ed. It was clear from Ed’s warm reception of Gunther that he was a familiar acquaintance. Despite his physically imposing frame, Ed was mild-mannered, polite and soft-spoken. Gunther and Dr. Tarim asked the usual outreach questions, inquiring about Ed’s health and well being and asking if he needed any of the supplies we were carrying with us — items like granola bars, hand warmers, hand sanitizer and socks. I happened to glance down toward Ed’s feet at the same moment Gunther asked, “How are your shoes holding up?” It was a gentle but pointed inquiry. The answer was obvious to all of us without Ed saying anything. His black, leather shoes were well beyond the point of “holding up” — they were literally falling apart. Only his left shoe had a shoelace. Threads were coming out of the seams on both soles and there were large gaping cracks in the leather on both shoes. The hole on the top of his left shoe was so large that I wondered how it was staying on his foot, let alone providing any protection from the cold. At that moment, I had to turn away. A large lump had formed suddenly in my throat and hot tears were stinging the corners of my eyes. Although I’d been working at GMC for 9 months by this time and had witnessed guests experiencing homelessness in dire situations before, something about the image of Ed’s tattered shoes struck me. 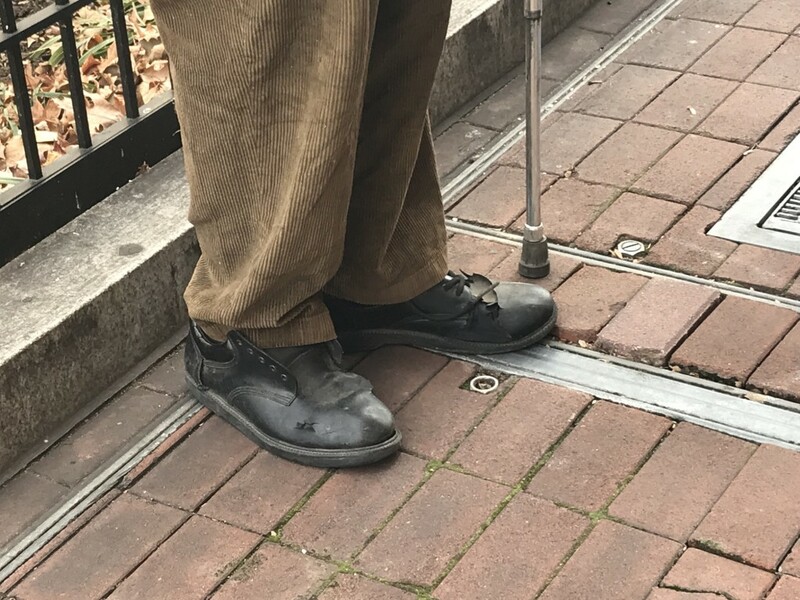 I felt a mix of compassion for this gentle soul - how long had he been wearing these shoes that were disintegrating on his feet? – and anger that I wasn’t sure where to direct. How were we – as a society, as fellow human beings — allowing this? The holes in Ed’s shoes didn’t form overnight. How many others had passed him, noticed his broken shoes, and just kept walking, ignoring his obvious need? Our interaction with Ed was just one of many we had that afternoon. Walking for just a few hours, we were met with individual after individual — both men and women, of varying ages, backgrounds and dispositions — each with their own story. They all recognized Gunther and knew immediately why he and Dr. Tarim were there — to offer help, even if only on that day in the form of a plastic baggie filled with toiletries, snacks and socks. I don’t know how Gunther knew Ed would be at Miriam’s Kitchen, a neighboring non-profit that aids those experiencing homelessness, the next day. It was one of the many small enigmas I was perplexed by working with someone who had been doing their job for nearly 30 years — I guess, like in most jobs, some things are learned with experience. I do know that my experience on outreach that day cemented in my mind as an absolute surety the dire need our community has for organizations like GMC. It is our responsibility to recognize the needs of our neighbors and to help those who cannot help themselves. Georgetown Ministry Center is a year-round drop-in center, providing psychiatric and medical outreach, social and mental health services, case management, shelter and housing support, handicapped-accessible bathrooms, and laundry facilities to one of the very neediest populations: chronically homeless individuals who suffer from mental illness, substance abuse, and developmental disabilities, as well as physical injuries. 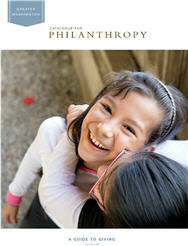 Many are resistant to help, so GMC creates a welcoming environment that fosters trust. Last year it reached nearly 1,000 homeless individuals, including 60-70 “regulars.” An on-staff psychiatrist served 100, while a general practitioner provided care to 350. Moving from the streets to housing is profoundly challenging for this population, but for those who achieve it each year, GMC supports them at each step. This entry was posted in Guest Blogger and tagged advocacy, Affordable housing, Health, Homeless, Homelessness, Housing, Nonprofit Sector, Philanthropy, Poverty, Volunteering by Catalogue for Philanthropy. Bookmark the permalink.